The UK Energy Research Centre (UKERC) recently issued a warning about the limited role that gas will play in the future energy mix of this country. According to research released by the organisation, the scope for using gas in 2050 is just 10 per cent higher than it was in 2010. On the back of this news, we asked our readers about the best way to address the issue. 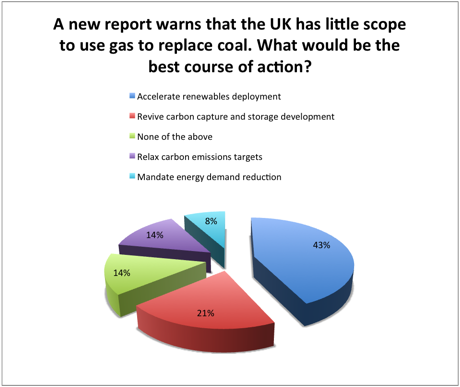 Nearly half of the 431 respondents (43%) backed accelerated deployment of renewables, with over a fifth (21.5%) instead favouring a revival of carbon capture and storage (CCS). The Government’s cancellation of the UK’s CCS demonstration project was heavily criticised by a recent cross-party report, and the UKERC says that the technology will be vital if the UK is to meet future environmental targets. One way to avoid that problem is by relaxing carbon emission targets, an approach that 14 per cent of readers believe is best. Around 7.5 per cent of respondents said reducing energy demand is the best way to tackle the issue, while just over 14 per cent voted for none of the above. The poll is now closed, but please continue to share your opinions in the comments section below. Is it actually possible to combine renewables and CCS to create drop-in fuels that are almost the best of all worlds? The research is there, time to add some oomph to making it a commercial reality. We need nuclear! I know it is a poll but you have made severe restrictions by saying choose one category. That stops any nuanced discussion – part of the problem? Keep gas-powered turbine-generator sets for peak-lopping, and as stand-by for when ‘renewables’ fail to meet demand, especially with wind turbines when the UK sits under a high-pressure system in very cold mid-winter. Turbine generator sets can be brought on line swiftly (albeit not as fast as pumped storage systems), to help avoid power outs. Carbon capture can be increased by fertilizing plants with CO2 in green houses. This can increase growing of plants by 40%. If you make energy by burning NG, you could get clean CO2 by using catalytic boiler. Plants are much more sensitive for impurities like SO4, NOx, C2H4 than human beings. This way you could save heating energy and eliminate carbon emissions. The world is awash with natural gas at a price, e.g. LNG trade is increasing exponentially and shale gas is waiting for the will-to-go. The lowest cost and seriously best alternative is to recognise that we have (still, even if threatened by enviroo-nuts) a fleet of excellent coal fired power stations that, if the CCA taxes were removed would make the lowest cost power possible for the UK and improve our competitiveness for little capital spend. Unfortunately, the lunatics have run the asylum for too long now for realism to be valued. I fully agree with your comments including the lunatic reference. Forward planning seems to be something that past governments and all political parties are incapable of. We used to be world leaders in nuclear engineering and because of pressure groups and without forethought they have allowed it to diminish until we are no longer credible in this industry, meanwhile the other major nations build up their expertise. Also we still have coal reserves capable of sustaining power generation for hundreds of years. I accept that we may need carbon capture but technology is there to make the processes of coal burning cleaner. Even if it is not the long term solution it should not be discarded without a credible alternative. In the meantime we seem to be prepared to leave our power generation capabilities at the mercy of foreign supply sources some of whom may turn out to be less than friendly. Minority pressure groups have dictated policy for too long and left the country with few and weak options. It needs to stop and we need a long term (40 year ) plan to get us back on track; unfortunately I feel that, while we are run by politicians, few of whom who have a background in anything other than politics and who can see no further than the next election, then we are going to see a continual slide in British control of power generation . Combine efficiency and renewables. Reduce energy demand as much as possible, and generate what is needed by renewables. Nuclear power and shale gas were both missing from the options and both are far more accessible than CCS. They would not need the relaxation emission targets and would provide much more reliable sources than renewables – although I do believe that renewables do have a part to play. The source of gas – conventional or shale – does not make any difference to UKERC’s analysis. It’s all methane, and produces identical emissions when burned. There was an idea some years ago to fuel our existing coal-fired power stations with coppiced wood such as willow.This produces 2-3 crops a year and i remember a study showing that we could be self-sufficient if only we planted more woodland .I imagine that the resultant gas emissions would be easier to filter or precipitate than those from coal. Furthermore , we would have a new industry in the management and harvesting of these woods. Can this idea be re-visited by those in-the-know? I don’t know what trees you have seen but in my humble opinion getting 2 to 3 crops a year from a tree sounds mighty ambitious ! is each crop a few inches of new growth ? or onc crop per year from 2 or 3 different areas of the forest ? I believe that we need a substantial percentage of electricity demand to be supplied by base load nuclear with top – up from gas, biomas, renewables. It is very difficult to see how this can be achieved by ‘market forces’ alone as recent experience proves. The apparent move to peak lopping by polluting diesel generators sounds very ‘third world’ to me. Coal seems to have been demonised by the green sector. It can provide low cost bulk energy and be clean. The recent cold weather clearly indicated wind was not a credible option and is at best a diluted and intermittent source of power .On the period of peak demand it contributed< 2%. I wonder how this is explained away by the supporters of wind power. Gasification of indigenous coal might be made to work and also provide a buffer against the volatility and uncertainty surrounding gas and liquid hydrocarbons. Don’t know where you get your figures from Phil, wind regularly contributes over 20% to the mix, and we have long ago passed the point where wind can and DOES contribute more than nuclear on certain days. go to http://www.gridwatch.templar.co.uk/ and you will see what is actually producing WATT on a minute by minute basis. I realise that there are less comfortable careers available in wind than there is in nuclear, and the deal nuclear has with the paymasters is that they get to sell every watt they produce, whereas wind is constantly told to reduce their output to match demand. This amounts to a huge subsidy for nuclear . This misses the point – on those beautiful winter high atmospheric pressure mornings when the air is still and the temperature is below zero, wind power is not a lot of use. For systems such as wind power to be more than PR, effective energy storage systems need to be developed to make the most of the windy days. Nuclear is off the list for some reason. Renewables are OK, but without some major improvements in energy storage, are just going to lock in gas – and to a lesser extent diesel – for future electricity generation. The other point is that most gas is used for heating. Improved insulation and the deployment of heat pumps will be needed to reduce that. All a scam to increase revenue and gain acceptance from the public through fear using shortages of gas as the stick to beat them into submission, and most are gullible enough to swallow their lies. We have thorium as a potential nuclear source and the capability to add a percentage of spent nuclear waste to prevent storing it in the future, so cleaning up nuclear from the past. We can make our own gas, HHO; this is hydrogen + hydrogen + oxygen using a simple gas generator from stainless steel plates which anyone can make at home and many do. Wind and water? that’s all it is and all that is needed is a small wind turbine such as my 750W item to power a battery pack and a small gas generator about half the size of a normal car battery. Power is fed to the gas generator at around 30 amps @ 12 V and you generate HHO at a rate of over 30 LPM ready for storage. No transportation, no drilling, no fancy infrastructure, and better still you can build your own system. HHO produces fewer emissions in combustion then other gases, requires very little to scale it up to industrial capacities, and it can be made in the UK. Next we have the modern variant of the water wheel, vortex accelerated water and we have enough weirs on UK rivers alone to install them and meet current demand, little work to do, no fuel costs, and harnessing the most natural power source in the world. But; as we all know its all controlled by big business and they want the most expensive as it produces the results in the pockets of the shareholders and they expect the taxpayer to subsidise it all while they take all the profits. Gas is the best available bridge fuel, due to a 20 year Government failure to construct Nuclear. Accelerate Nuclear , and incidentally we have some of the strongest tides in the world in the Pentland Firth, entirely predictable as long as the Moon goes round Earth. What we should be doing is using renewables to build up a HYDROGEN infrastructure, why are we not doing this, the technology exists . The International Energy Agency finds that fuel cells have the potential to meet and exceed US DoE cost targets for carbon capture and storage (CCS). California Air Resources Board stated that fuel cells powered by waste water have negative carbon intensity. British engineers developed the first practical working fuel cell and have continued to work with no backing to produce cheaper materials, which are now being tested overseas. Fuel cells balance the loads from solar and wind power, utilising hydrogen generated when demand is low. They are also powered by energy from waste, leaving valuable by-products. They are so clean and quiet that they generate electricity and heat on site with very high efficiency. Target the principal users of energy and drive efficiency through tax incentives. Use the money saved by not building wind turbines on renewing the housing stock for the poorest. > we improve living standards for the most vulnerable in society and potentially re-use land more effectively for further investment. 16:36 Friday 26th February . Wind is contributing 0.7% to aggregate demand. Unless I am living in a parallel universe or the figures are being mischievously massaged this comes no-where near the 20% of generation mixe claimed. Renewables are intermittent, dilute and expensive options. Get real! My comments seem to have already been said, but I think we have to get some more nuclear power to bridge to a time when solar is significantly more efficient than today and fusion starts getting closer to being available. Nuclear however should be nationalised (and this is against my normal political view) but its just too big and too financially risky to put on a commercial footing. The high tariff the government has had to give the French / Chinese consortium illustrates the size of the risks involved and if we took these financial risks as a nation then we would all benefit if nuclear came in cheaper but all shared the cost if it was more expensive – and you know that UK government will have to step in and bail out the consortium if it goes wrong (like the banks) so why don’t we take the financial risk at the start and have the possibility that we might get some cheaper electricity as a reward rather than foreign businesses taking it ? I am again absolutely blown-away by the style, content, and sheer professionalism of the comments offered. It is quite clear that ‘we’ Engineers and technologists have reached the point where we are soon going to be able to dictate to the ‘shams’ (those who simply manipulate man’s laws-which they and their ilk have forced upon ‘us’ for centuries- to the benefit of whoever pays them the most?) what will happen. Power supply and its continuation surely a pivotal aspect to the future of every society. Because if they don’t finally take notice of their ‘technical betters!’ there will be nothing for them to ‘manage’.